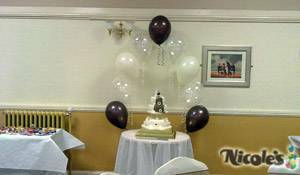 Nicole's Balloons shop in Wolverhampton has been established for over 10 years providing balloon decorations and deliveries for all occasions and budgets. We are an established and trusted high street retailer with a reputation for commitment and high integrity. 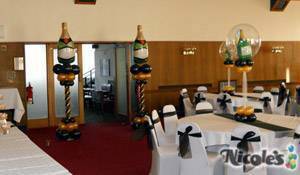 Whatever the occasion, why not enhance your event with our range of stunning balloon decorations. 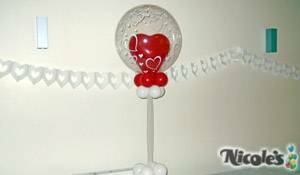 Children's parties, christenings, birthdays, weddings, prom night, corporate, business - Whatever the occasion, why not enhance your event with our range of stunning balloon decorations. We also offer a range of DIY balloon packages, helium bottle hire as well as balloon races and releases. No matter what the occasion is, whether a small kids party to a grand scale wedding ceremony, we are here to help you. There are so many ways to utilise balloons thanks to the vast amount of colours and styles available. 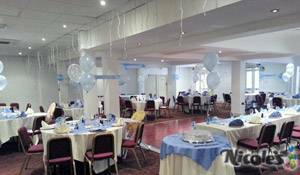 Balloons can be used to decorate venues for weddings, birthdays, everyday parties, christenings, anniversaries, prom nights and so much more. Balloons can be used for public events such as a fundraiser, a grand opening and new product launch. The options are endless. We cover Birmingham, Cannock, Dudley, Stourbridge, Telford, Walsall & Wolverhampton. Our retail shop also stocks thousands of products covering party items such as banners, candles, table confetti, gifts for all occasions, greeting cards, candles, bath bombs, jewellery as well as brands including Me To You, Fizzy Moon. Our range of goods and services are ever increasing and we are always looking to offer our customers the best possible deals without compromise on quality or service. We have a staff complement with exceptional skills and customer service. 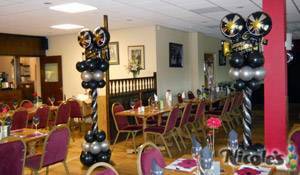 A video of our balloon decorations installed around the West Midlands, Shropshire and Staffordshire. 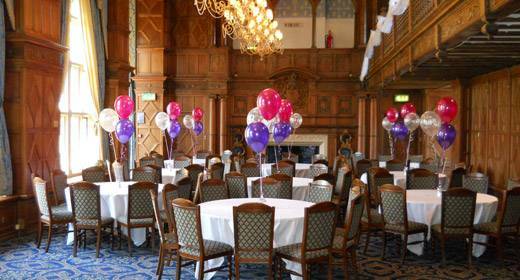 Balloon decorations are a great way to create an uplifted atmosphere at any venue. 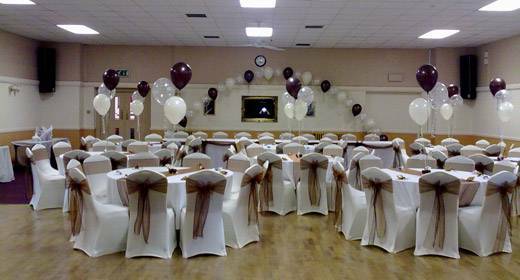 Whether it is a wedding, business event or a celebration we have the right balloon package to suit the occasion. There are many different colours, sizes and styles of balloons to choose from. 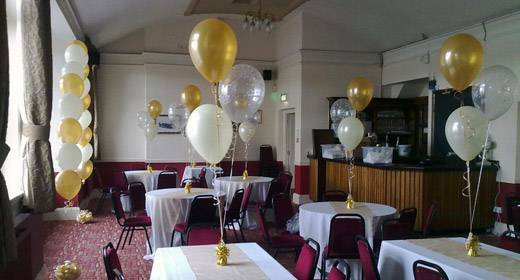 Our qualified balloon staff will help tailor make a package to suit both the occasion and budget, without compromise on quality or service. For customers wanting to do it yourself, we have in store a wide range of balloons with competitive pricing and a vast array of colours and designs to choose from. We use only biodegradable professional latex balloons to comply with current legislation. Nicole's Balloons also specialise in balloon deliveries (also known as balloon in a box) for all kinds of occasions and is a great alternative gift. When you choose a Balloon Delivery, we offer a big range of fun and bright colourful helium balloons in a variety of sizes all at low prices with fast delivery. We can deliver a single balloon in a box or a big balloon bouquet direct to your relatives, loved ones, work colleagues or friends. We have worked with many businesses of all sizes over the years creating balloon displays for sales and marketing purposes. Perhaps as a business you want to promote a product or service to the trade or general public? or maybe you are holding an annual conference or dinner party, then this is where balloons come into their element. 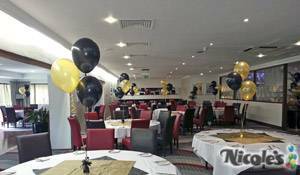 Professionally designed balloon displays created by Nicole's help transform rooms and furthermore can be customised with your corporate colours and logos. 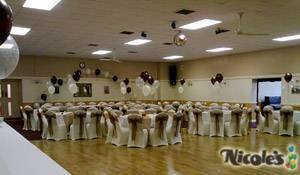 Balloon clusters are perfect for decorating tables at weddings and parties as well as floor standing for entrances. 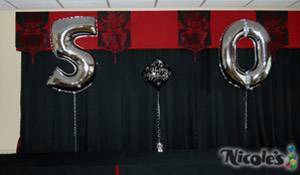 The range covers both latex and foil balloon displays. Typically balloon clusters will comprise of 3 or 5 balloons and are tied to a decorative weight. 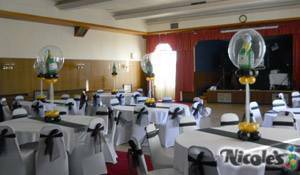 String of Pearl arches are generally used as a backdrop behind a top table, cake table or enhancing an area such as a stage or dance floor and are suitable for indoors use only. 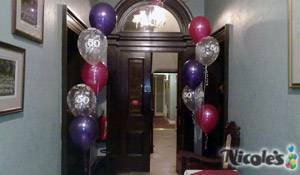 Garland balloon arches are a great way to attract attention and overall help create a great experience. 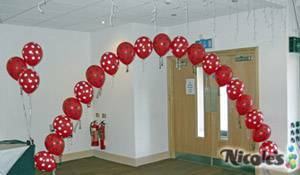 Our balloon arches range from small to extra large in size thus can accommodate a wide range of uses. Balloon arches are visually pleasing and easily noticed. 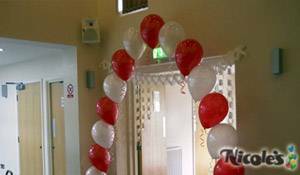 Balloon arches are also used a lot for birthday parties, weddings and many other functions. 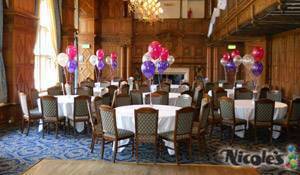 There are hundreds of balloon colours available in order to match your required colour scheme. Columns are very versatile and can be used as pillars for an arch, a focal point or either side of an entrance and come in a variety of styles. These are a set of floating balloons which are linked together and are perfect for creating an eye-catching backdrop. 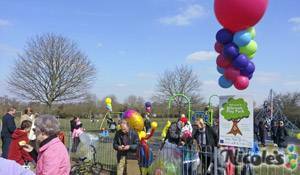 Here is a further selection of photographs detailing our balloon decorating service. 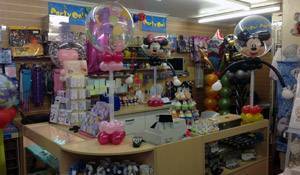 As our balloon shop is open 6 days a week you are more than welcome to view both our full portfolio of work and balloon creations in-store. Further photos of our party balloon decorations are available to view on our Facebook Page or you can follow us on our instagram page. Please see below for a range of our most popular selling balloon packages. For further detailed pricing, please give us a call on 01902 741853 or pop in-store. 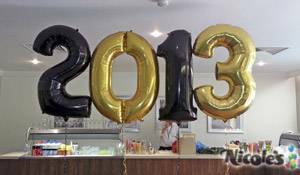 When pricing for balloons we ensure that you will not be disappointed or mislead. Therefore, we only use the very best high quality balloons which are made from 100% natural biodegradable latex and back this up with exemplary levels of service. We are passionate about balloons and take great pride in our work. Our customers have given us great feedback and testimonials over the years. Whether you have a budget in mind or an idea floating around, we will ensure that we create a ballon package suitable for your needs. 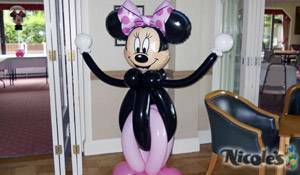 Our balloon decorating service covers most parts of Birmingham, Cannock, Dudley, Stourbridge, Telford, Walsall, West Bromwich and Wolverhampton. 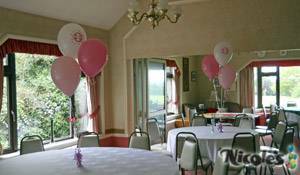 The above popular balloon packages can be customised in any way to suit your desired budget and collected in person or delivered locally for an additional small charge. Whether you are after a small amount of latex or foil balloons to an entire balloon themed event, please get in touch and we will offer you professional advice and competitive prices. Alternatively why not pop in to our balloon shop in Wolverhampton, which is open Monday to Saturday to have a look at our latest designs. 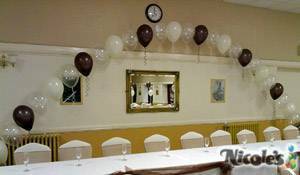 For all your balloon decoration requirements and quotations. 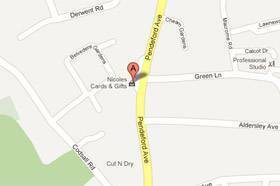 If you wish to visit our shop then please click on the map and this will provide you with directions.